What links biodiversity and linguistic diversity? And why does it matter? A paper published in PNAS last week suggests that areas considered important for conservation of biological diversity may also be hotspots of linguistic diversity. This paper has got a lot of press, with articles wrongly claiming that loss of cultural diversity is linked to the loss of biodiversity. This makes it sound like there is a direct connection. There isn’t. Or at least not as far as I know. It just so happens that places that are rich in species diversity are also often rich linguistically. There also appears to be a weak correlation between linguistic and plant species diversity, but the relationship remains untested for other taxonomic groups. Even given this, there are plenty of reasons why areas of high species diversity and high linguistic diversity might overlap. Prior to the article last week, I made the presumption that the linkages between biological and linguistic diversity were indirect. Just because they co-occur, does not mean that one causes the other. My best guess was that species and linguistic diversity may be driven by similar processes. Species diversity in birds is best described by elevational range in a particular area and temperature1. The theory is that a wide range of elevations leads to speciation as a result of the development of elevational niches. 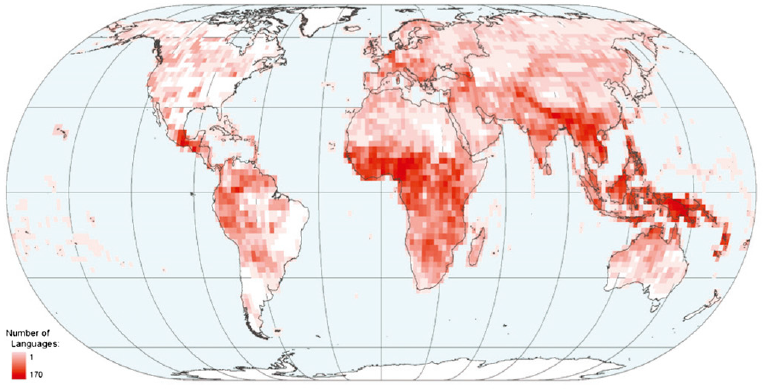 Areas with high annual temperature, coincide with areas which are thought to have had relatively stable climates in the past, thus reducing the probability of extinction for species with small ranges. It seems feasible that areas which are more isolated from each other may result in the birth of new languages, in a process similar to speciation. Because of this mountainous and heavily forested areas might be expected to be relatively rich in languages since they restrict movement between one area and another. The past climate stability may also help in the maintenance of languages in relatively small areas by reducing the need for trade between communities. Given tropical forests and mountainous areas are often considered to be conservation priorities due to their high numbers of endemic species and general species richness this may help in part to explain the relationship. Whatever the reasons for co-occurrence, the threats to languages and species are similar. Habitat loss, particularly of forests, is driving this loss. As rightly pointed out in the article, this points to a potential means of protecting both biodiversity and endangered languages. The idea is that if you can protect the cultures in certain areas they can help to protect their local biodiversity. While I agree that this is a great goal I struggle to see how it can be effectively achieved everywhere. I would guess that*, similarly to species conservation, the approach used to conserve languages will have to vary from place to place. In areas that are relatively remote both species and language conservation may need to focus on reducing disturbance as a result of drivers such as deforestation and road building. Meanwhile, in areas that are relatively inhabited, where perhaps a native language is being subsumed by a larger language, direct intervention may be required. Since the majority of endangered languages are likely to fall in to the later category, as do endangered species, there may be win-win situations for linguistic and species conservation. I am still not that convinced though. Conservation has a bad history of attempting to address issues outside of its standard remit, such as development, and often gets things wrong. This is not to say it can’t be done, but rather that it remains to be seen how the two can complement each other. If you have any examples of how language and biodiversity conservation can work together please leave a comment below. *This isn’t just a turn of phrase. I’m an ecologist. Not a linguist. I have little idea how you actively conserve a language. Davies, R. G., Orme, C. D. L., Storch, D., Olson, V. A., Thomas, G. H., Ross, S. G., Ding, T. S., Rasmussen, P. C., Bennett, P. M. & Owens, I. P. F. (2007) Topography, energy and the global distribution of bird species richness. Proceedings of the Royal Society B: Biological Sciences, 274, 1189-1197. Gorenflo, L. J., Romaine, S., Mittermeier, R. A. 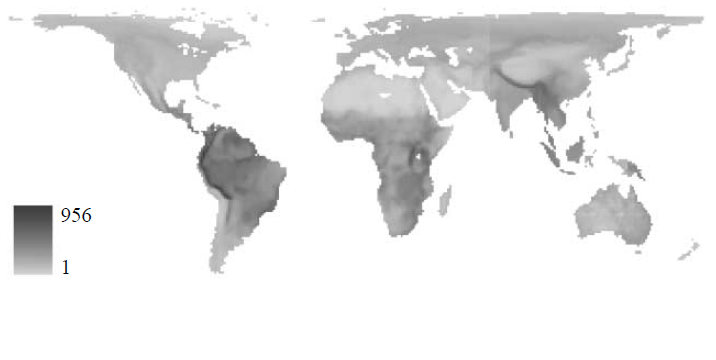 & Walker-Painemilla, K. (2012) Co-occurrence of linguistic and biological diversity in biodiversity hotspots and high biodiversity wilderness areas. Proceedings of the National Academy of Sciences.